The Little Indian (Individual KinderReaders Title) Let’s go on a bear hunt! The little indian goes out looking for a bear, but wait until you see what happens when he actually finds one. Ten Little Indians: Make a book by cutting and gluing Indian figures to numbered pages. Take a picture of each child holding the Indian symbol he painted onto a crumpled brown grocery bag that has been dipped in water and allowed to dry. Make this into a class book with predictable text, such as “This is a teepee,” said Ann. Print out a page of Native American symbols and “buffalo skin” on which to write a story using the symbols. Compile these into a class book. Feather Sort: Ask each child to bring a feather to school (or provide feathers for them.) Discuss attributes by which the feathers could be sorted (size, color, texture). After sorting the feathers according to one of the attributes, make a graph . Indian Beads: String 2 or 3 colors of beads on yarn in an AABB or AABBCC pattern. Dyed macaroni and/or cereal could be used in place of real beads. Addition/Subtraction Readiness: After reciting the poem, Ten Little Indians, talk about what occurs when you add “one more”. Use flannel board pieces or unifix cubes to act out the poem. Then do the poem in reverse and discuss “one less”. Totem Pole Shape Count: Design a totem pole and fill in with various shapes (triangles, circles, squares, ovals, diamonds). Have students color each shape a designated color and then count how many of each shape. Indian Drums: Cover a coffee can with decorated construction paper. Use the drum to create musical “patterns” or count drum beats. Find five small, flat stones. Paint a moon on one side of four of the stones and a star on one side of the remaining stone. Children take turns shaking the stones from a wooden bowl or basket. Children get one point for each moon and two points for a star. Each child counts his points and the one with the highest count wins. For younger children, they could count out unifix cubes as a visual connection to the number of points awarded for the moon and star symbols. KWL Chart: Begin a unit by making a KWL chart about Indians (What We Know, What We want to Know, and What we Learned). 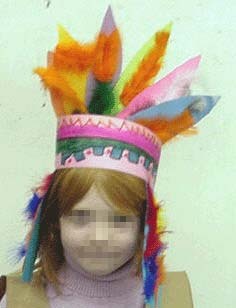 Native American Visitor: After looking at many pictures of different tribes, try to have someone of Native American descent, possibly even a parent, visit and answer questions. covered long house on the Pacific north west, a sand covered pueblo in the southwest, a hogan in the mid-southwest and the thatched roof on poles in the Everglades. Discuss how many Native American names are taken from nature because nature is so important. Talk about what a tribe is and how your class can be like a tribe. Have each student give themselves Native American names by combining a describing word with a word from nature (animal, plant, weather, landform…) Or send home a note asking parents to help their child think of an appropriate name to fit their personality. Try to stick to animals that are native to your area so Flying Elephant is not a choice. Some examples of names are Silver Hawk, Mountain Flower, Chattering Chipmunk, Running Deer. Allow the students to use these names during various activities. For kindergarten, it’s another opportunity to create a new name chart for alphabet letter practice and new nametag. To turn a playroom into a Native American village, I covered our play loft with paper to make a pueblo, a round table with paper to make a Navaho hogan and constructed a teepee in another corner. I used real rocks and construction paper to make a council fire in the center of the room. I had a large loom near the hogan for a community weaving projects, a cardboard box canoe and ‘bear skin’ rugs near the teepee as well. We had a cabbage patch baby named ‘Little Rain Drop’ that could be wrapped in a real rabbit skin and tied onto a papoose board. They could go hunting by tossing bean bags at pop cans covered with pictures of real deer, rabbits, turkey and buffalo (Thank you, National Geographic!). They could fish from the canoe with a magnet pole. (I made felt fish with magnets sewn inside. These could be ‘cooked’ over the fire better than paper ones.) My students learned about picture writing and naming ceremonies. I had them go home and come back with a name that their family decided best described them. (I will never forget the little girl who proudly proclaimed herself ‘Chattering Chipmunk’!) Their names were added to a tagboard headband that had been painted with a pattern. We made drums from oatmeal and coffee cans and dancing bells by stringing jingle bells onto ribbons or gluing them onto a popsicle stick with hot glue and feathers. Every day at the end of the day we would have a ‘council fire’ to talk about our day and I would award feathers for good workers, good helpers, kind friends and one -only one – ‘eagle feather’ a day. Our ‘Harvest Feast’ taste fest always included venison strips, cornbread and fruit slices. Indian Symbols: Paint a symbol on a crumpled grocery bag that has been dipped in water and allowed to dry to make it more realistic looking. Use these symbols for a class book or to make a predictable chart. Totem Pole: Cover a paper towel roll with a totem pole motif. Turn bag upside down and cut up the middle and around the bottom of the bag to make a hole for the neck. Cut out the sides to make armholes. Turn inside out and decorate with Indian symbols. Fringe the bottom by cutting approximately 4 inch slits about one inch apart. Cut two canoe shapes from a grocery bag or index paper. Punch holes along the side and bottom edges. Sew with yarn. Glue Indian figure cut-outs inside the canoe. Stack two pieces of construction paper and cut two rectangles (approximately 8 inches x 6 inches). Keeping the two pieces stacked, round the corners of the rectangles. Make a horizontal cut across one of the rectangles approximately one-third of the way down. Punch holes through both of the stacked pieces around the edges. Use yarn to sew through the holes and create a pocket. Decorate an Indian baby figure and place in the papoose. Tie a length of yarn to the top edges of the pocket so the papoose can be worn on the child’s back. Decorate a sentence strip with geometric shapes. Fit to child’s head and staple. Glue craft feathers to paper feather cutouts and then staple these feathers to the band. For a more realistic look, cut two index paper rectangles approximately 2 inches wide by 5 inches long. Glue feathers the length of the rectangles. Staple these to the bottom of the headband on each side of the face. Teepees: Decorate a construction paper semicircle and roll into a cone shape. Glue toothpicks at the top opening to simulate the wooden frame. T-shirts for Native Americans: Dye T-shirts light brown. Have children draw symbols on the shirts. Cut slits around the bottom and put beads on them. Quiver of Arrows: Cut two rounded pockets and punch holes around the edge. Decorate the quiver shape with Indian symbols. Sew, leaving a long piece of yarn that makes the quiver “wearable”. Program arrow cutouts with vocabulary words to practice. Cut a 7 inch tortilla in half and form each half into a cone, overlapping slightly and leaving a center top opening about one-half inch across. Secure with a toothpick. Dip ends of pretzel sticks in canned frosting, then insert 3 pretzel sticks into center opening of each tepee and spread slightly apart, pressing against inside of tortilla to adhere. Dilute food coloring with water and use a paintbrush to make designs on the the side of the tepee. Squanto taught the Pilgrims to plant corn by putting fish in a small hill of soil with the corn seed. The fish provided the growing corn with food. Use these materials to act this out. Crush two Oreo cookies in a ziplock baggie. Put half this “dirt” into a clear plastic cup. Add goldfish cracker fish and candy corn “corn”. Cover with more oreo dirt. Popcorn: Pop popcorn, and tell the story of it being the first cereal! (the Native Americans introduced it to the Pilgrims) Make little canoes out of paper and eat your popcorn out of it. Animal Tracks: Use animal track templates to make animal tracks in clay or in plaster or to create rubbings of the tracks. One little, two little, three little Indians. Ten little, nine little, eight little Indians. Seven little, six little, five little Indians. Four little, three little, two little Indians. Sitting like an Indian, just like an Indian. On the second day of Thanksgiving the Natives gave to me..
and a pumpkin in a pumpkin patch. On the fourth day of Thanksgiving, the Natives gave to me..
On the seventh day of Thanksgiving, the Natives gave to me. On the eighth day of Thanksgiving, the Natives gave to me..
and a pumpkin in a pumpkin patch!